Following the aftermath of Friday night’s mayhem, a peaceful, less eventful demonstration on Saturday morning gave a chance to protesters to recover their spirit and continue their battle against austerity. 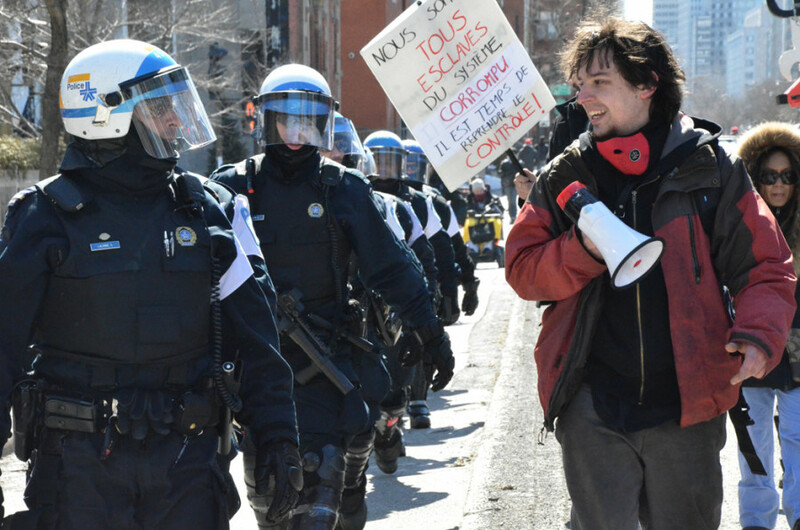 Organized by the Printemps 2015 collective, people gathered at Place Emilie Gamelin once again to protest against the austerity measures and the cuts in the public sector. Thousands were present and ready to go. Police were prepared to intervene at any moment. However, the Saturday protest felt nothing like the madness that took place on Friday night. The tear gas, pepper-spray and rubber bullets were replaced by bagpipes, drums and people dancing in the street. Students, union workers and parents with their children marched as the police were following them, without any side being provocative. Various individuals from stores and homes welcomed the demonstration and showed their support by cheering and banging pots and pans. There was little to no mainstream media presence, a fact that was pointed out several times throughout the protest. The crowd marched from Berri St. for about three hours all the way to Jean Talon St., where it joined an Anti-PEGIDA protest that was organized for the same day.